A swath of snow is expected to track from the North Central states through the mid-Atlantic and southern New England on Wednesday into Wednesday night. On the heels of the storm that delivered mostly rain, but also a swath of ice and some snow to the Northeast on Sunday, a pair of Alberta Clipper storm systems will take a path from western Canada to the northern Plains to the mid-Atlantic. The storms this week will travel through a swath of seasonable temperatures with colder air to the north and warm air to the south. Both storms will bring a band of nuisance snow to the North Central states but could have very different results in the Northeast. The first system started on Monday across Iowa before reaching across Pennsylvania on Tuesday. Generally, this system spread a coating to 2 inches of snow across the area, leading to some travel disruptions. Another round of snow is on tap for the Ohio Valley and mid-Atlantic for Wednesday as the second system tracks across the region. Wednesday's storm will spread 1 to 3 inches of snow from the West Virginia mountains to Pennsylvania, New Jersey and southern New York on Wednesday. 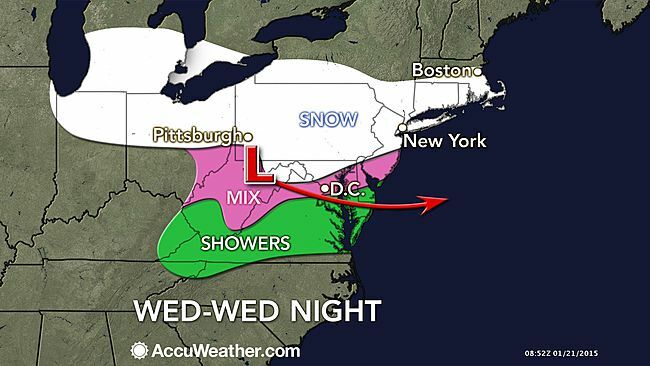 The southern fringe of the snow will affect Washington, D.C. The snow's northern fringe will then spread over Boston on Wednesday night into Thursday as the snow takes a track over southern New England. A narrow band of moderate-to-heavy snow may develop over part of the mid-Atlantic and could overcome marginal temperatures and warm road surfaces. Rain or a wintry mix could quickly change to snow. 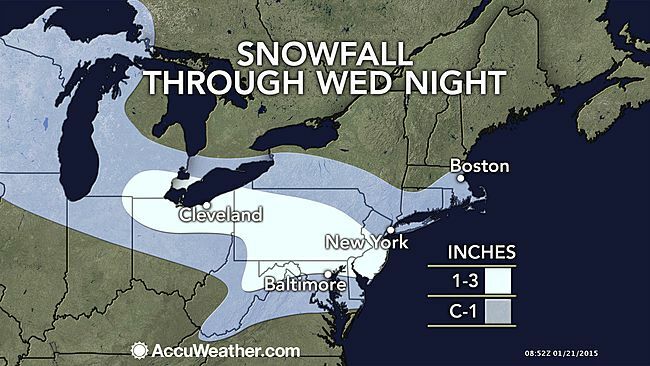 "If this narrow band of heavier snow develops, it can quickly cover roads during the daytime hours, or in this case during the period from the afternoon into the evening," according to AccuWeather.com Senior Meteorologist Alex Sosnowski. "Such a narrow band of snow could develop over parts of northern West Virginia and northern Virginia to northern Maryland, central and southern Pennsylvania, northern Delaware, and southern New Jersey." A major snowstorm will not develop, nor will black ice be an issue, but enough snow will fall to cause headaches for travelers and potential interruptions to daily routines for residents. Motorists should prepare for roads to turn slushy and slippery, while airline passengers may be faced with delays. "The main time for travel problems along the I-95 corridor from Philadelphia to New York City on Wednesday will be during the evening and overnight hours," stated AccuWeather.com Senior Meteorologist Dave Dombek. "The snow will struggle to accumulate within this zone during the day due to above-freezing temperatures and melting. During the evening, the worse it can get for travelers as temperatures fall." People traveling along Interstate 83, I-70, I-76, I-78 and I-81 in the region should be prepared for delays related to snow and slippery roads for the drive home on Wednesday. As the snow departs, fresh chilly air will pour into the Northeast later this week. Even colder air will then close out the month.